Make your macaroni & cheese, lasagnas, gratins, or “cream of” soups, and more even better with this recipe for rich & creamy classic Béchamel sauce. We made it! This is the last of our 5 French Mother Sauces for #saucesome March and I saved the best (or most beloved) for last – Béchamel Sauce! This sauce is the base for so many yummy things – from Macaroni & Cheese, to gratins, to homemade “cream of” soups. This is one of those sauces that once you master it, you’ll find yourself using it all them time! Béchamel sauce was original made with lean veal, herbs, and spices that were simmered before adding cream and a white veal stock and reducing. Somehow, that version of the sauce has evolved into what we know Béchamel as now, which is just a roux and milk with some aromatics. This is the only one of the 5 mother sauces that has a known origin, being named for a gentleman who was a financier and chief steward to King Louis XIV. It shows up in many cookbooks dating back to the Renaissance but was named a Mother Sauce by Auguste Escoffier in 1902. An oignon pique (pronounced uh-nyon pee-kay) is french for “a pricked onion”. It’s really just a fancy way of saying something that is super simple to make. 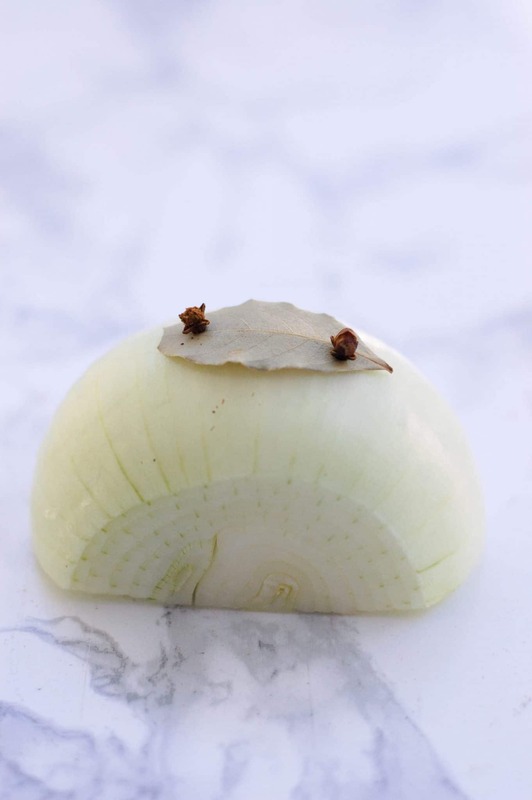 An oignon pique is made my taking half of a peeled raw onion, and placing a bay leaf on top of it. Then you use a couple cloves to attach the bay leaf – “pricking” the onion. One of the nice things about an onion pique versus adding aromatics in other sauces is it is really simple to strain out. Sometimes the onion will break apart a little bit, but for the most part, it beats the snot out of straining mirepoix. We’ll cover small sauces down the road at some point, going over how to make a proper Mornay, Cheddar Cheese, or Soubise, but for now, I want to talk about two quick variations for Béchamel sauce – a light and a heavy. Based on what you’re making, you may want a sauce that is thinner, or thicker – and instead of losing flavor by just watering it down with more milk, or a weird texture from over-reducing it, the easiest way to adjust the amount of roux, but not change the cooking time. For a light Béchamel sauce use 1.5 oz. each for your roux, and for a heavy Béchamel, use 3 oz. each. Scalding milk, in many ways is similar to proofing yeast for doughs. In fact, some dough recipes will call for scalded milk in place of water to give the dough extra flavor and improved texture. But what is scalded milk? Scalding milk is when you bring milk to the top of the poaching temperature range, reaching 180°F, before removing it from the heat. Scalding used to be more about killing off bacteria, as it was used before pasteurization became so commonly used, but for Béchamel sauce it is more about cutting down the amount of time that your sauce has to cook. Because milk has a tendency to burn to the pan at higher temperatures, this helps eliminate some of the cooking time to help prevent that. In other cases, scalded milk might be used to infuse flavors (such as vanilla beans for custard) or in bread making to keep the dairy proteins from killing off the gluten. Set a heavy bottomed sauce pot with cold milk on the cooktop over medium heat. Stirring constantly, bring the milk to 180°F. Try to maintain the temperature at 180°F for 10-15 seconds before removing it from the heat. Allow the pot to cool just slightly before use. TIP: If you don’t have a thermometer on hand, you’ll be able to visually tell when you’ve hit scalding temperature because the milk will begin developing small bubbles on the outside edge next to the pot and the milk will begin to get a very thin film on top. I would like to note that if you’re doing a really good job of stirring almost constantly, sometimes it can be hard to notice the bubbles or film because you are stirring them back into the milk. It’s okay to take a minute or two to stop stirring when you think you’re near the correct temperature to see if those form. You just don’t want the milk to start simmering. To really rock this Béchamel Sauce and make it to perfection – here are some culinary proficiencies I recommend reading up on before beginning. 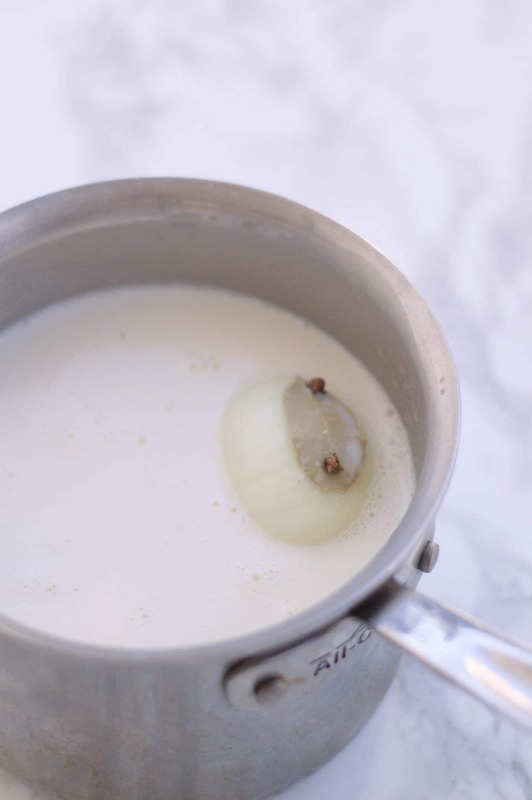 Poaching, Simmering, & Boiling : Béchamel is very prone to scalding and burning (which if you have an advanced palate, you’ll definitely notice), this gives the ideal temperature ranges so you’ll keep the temperature of you sauce under control. How To Clarify Butter : Learn how to separate the milk solids and water from the pure butterfat for the best tasting clarified butter. Easier Skimming. Once the sauce has come to a simmer, you can shift the pan so that only half of it is over the flame, or burner. This seems silly to do, but it makes skimming much easier since the film should only develop on half of the sauce. This makes it less likely that you’ll push it back down into the sauce, but can rather get it in one swift motion. Burnt Bottom. Béchamel Sauce is extremely prone to burning on the bottom if your temperature isn’t just right. To help prevent that, make sure to pay extra close attention to your whisking when incorporating your milk into your roux. Roux on the bottom of your pan is your enemy. During the early parts of simmering, you may want to carefully rub around the bottom and corners of your sauce pan to prevent scalding, but if you notice any texture building up on the bottom, only stir above it to prevent releasing the burnt parts, causing the flavor to permeate the sauce. Type of Pot. If this is a sauce you think you may make often, I highly recommend investing in a Windsor Sauce Pan. It’s sloped sides and easier to access corners makes it easier to incorporate your roux and prevent burning. I’ve recommended the copper-core version because it is a better conductor of heat providing even distribution and temperature. Starchy Flavor. While you may find that you reach the texture you want within 10 minutes or so of cooking, it is important to let it keep simmering for at least 30 minutes. This is to help cook out the starchy flavor of the flour. If you sauce becomes too thick, add in a little extra milk and keep cooking to try to make it to that half-hour mark. I hope you’ve enjoyed our series on mother sauces for #saucesome March. I’d love to see pictures of your saucy creations on facebook, instagram, or twitter – @foodabovegold. If this is the first part of the series that you’ve come into, here are the links to check out the other 4 French Mother Sauces. Are you ready to get saucy? Let’s make this final mother sauce – here’s a printable grocery list so you’re ready for the store :). Get your free printable grocery list for this Classic Béchamel Sauce recipe HERE. That grocery list has everything listed in easy-to-find grocery store amounts. If something doesn’t have an amount listed, that means you can buy the smallest available and still have plenty leftover. Béchamel Cream Sauce is the base for many delicious things we make, ranging from Macaroni & Cheese, to gratins, to "cream of" soups. Use this recipe to make it to true French Mother Sauce perfection! Assemble the oignon pique by attaching the bay leaf to the onion using the cloves like staples. In a heavy bottomed sauce pan, melt the butter over low heat until melted. Add in flour and stir until combined - cook for 1 Minute and then remove from the heat and let cool slightly. Over medium heat, bring the sauce to a boil, stirring constantly. About 10 Minutes. Reduce the heat to a simmer and add the oignon pique. Stirring occasionally, simmer for 30 Minutes or until the desired consistency is reached. Remove the oignon pique, and strain the sauce through a sieve lined with cheesecloth. Season with salt, pepper, and nutmeg - being careful to not let these flavors dominate the sauce. When stirring the sauce, be careful to not scrape the bottom of the pot in case anything has burned. This prevents the flavor from being released into the sauce. Wonderful explanation and tutorial to the most important sauces! I really enjoyed reading it.